Hajiyev also commented on the talks held between President of Azerbaijan Ilham Aliyev and Prime Minister of Armenia Nikol Pashinyan on the sidelines of the CIS heads of state meeting in Dushanbe in September this year. “As a result, Azerbaijan once again demonstrated its constructive position and strong determination to resolve the conflict through negotiations,” Hajiyev said. 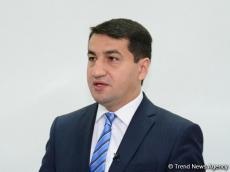 Hajiyev went on to add that Armenia pursues the policy of annexation of the occupied territories of Azerbaijan with illegal activities and in this way attempts to strengthen the status quo of occupation. He noted that Azerbaijan is a supporter of multilateralism and international cooperation. He added that Azerbaijan was historically located on the ancient Silk Road. Establishment of transport corridors doesn’t just mean freight, he noted. Hajiyev also touched upon Azerbaijan’s relations with the neighboring states and said that they are the priorities of Azerbaijan’s foreign policy. He added that Azerbaijan’s cooperation with Turkey and Iran, along with bilateral format, is developing on a trilateral basis and serves for the promotion of mutually beneficial regional partnership. “Last but not least, based on the reciprocal good will, shared interests and trust, it is possible to achieve successful models of bilateral cooperation,” he said.